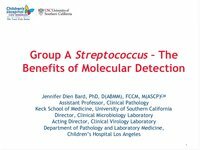 illumigene® Group A Strep � Taking the Guesswork out of Strep Testing Meridian Bioscience Respiratory Webinar Series - This program will provide a comprehensive overview of Group A Streptococcus, the benefits of molecular detection, and how illumigene® Group A Strep is the definitive solution for your strep testing needs. "LEANING" The Diagnosis Of Group A Strep & The Diagnostic Challenges of Bordetella pertussis Meridian Bioscience Respiratory Webinar Series - This program will provide a comprehensive overview of Group A Streptococcus & Bordetella pertussis and the benefits of molecular detection. Key Opinion leader Jennifer Dien Bard, Ph.D., D(ABMM), FCCM discusses Group A Streptococcus continues to be the number one cause of acute bacterial pharyngitis. This program will provide a comprehensive overview of this pathogen and the benefits of molecular detection along with the 2012 IDSA Guidelines that address diagnosis and treatment.